Students from the Universitat Pompeu Fabra (UPF) bring home a gold medal after they participated in the international competition of synthetic biology (iGEM). The iGEM team after their presentation of the project at the competition in Boston (From left to right: Marc Güell, Avencia Sánchez-Mejías, Marta Vilademunt, Óscar Rodríguez, Laura Sans, Jordi Pla, Dimitrije Ivančić, Eva Gonzalez, Guillem Lopez-Grado, Carla Castignani and Oriol Solà). 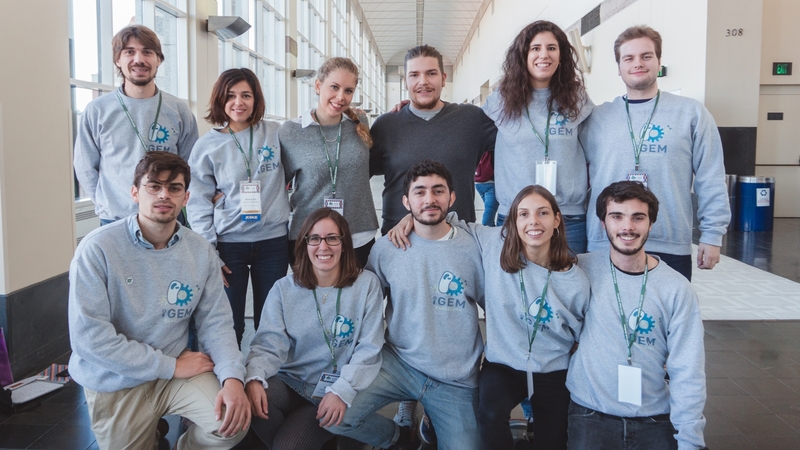 Last October 26, a team composed of 8 Human Biology and Biomedical Engineering students at the Universitat Pompeu Fabra (UPF) exposed their project at the iGEM (International Genetically Engineered Machine) competition, an annual event of synthetic biology in Boston, Massachusetts. 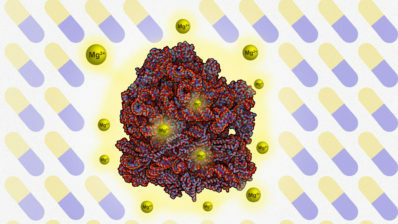 The project consisted in the genetic modification of a bacteria (Escherichia coli). 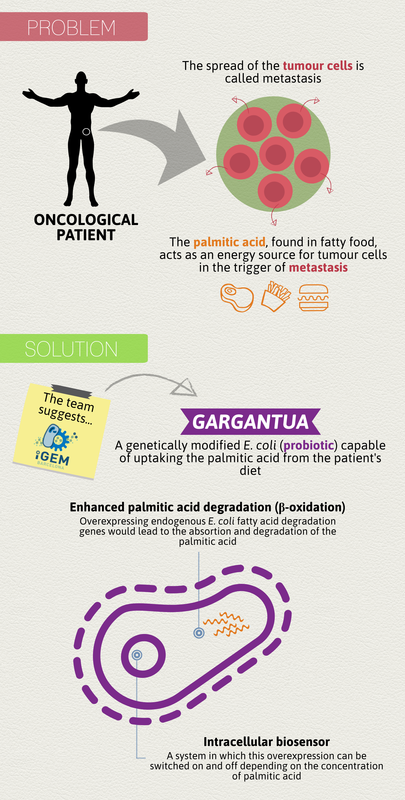 The aim of the modification was to design a probiotic capable of increasing the long chain fatty acids (LCFA) uptake from the oncological patient’s diet. Specifically, they wanted to optimize the palmitic acid metabolism because, according to a recent study led by the Institut de Recerca Biomèdica (IRB), it acts as an energy source for tumour cells in the trigger of metastasis. Enhanced LCFA β-oxidation: they would achieve this goal by overexpressing endogenous E. coli fatty acid degradation genes. Intracellular biosensor: a system in which this overexpression can be switched on and off depending on intracellular concentration of LCFA. When the students had to decide how to name their modified bacteria, they were inspired by a pentalogy of French novels written in the 16th century, which tells the adventures of two greedy giants: Gargantua and Pantagruel. iGEM is a competition in which students develop innovative genetic engineering systems. The competition was inaugurated in January 2003, at the Massachusetts Institute of Technology (MIT). In the beginning, the competition was only addressed to the MIT students but, nowadays, it has expanded internationally; in 2017, 310 teams from more than 40 different countries participated in the event. In 2009, the Universitat Autònoma de Barcelona (UAB) was the very first Spanish university to participate in this competition. However, it wasn’t till 2011 that the Universidad de Sevilla brought home the first medal. In 2018, the UPF students (UPF had been represented by another team in 2016 and they won a bronze medal) succeed at the latest competition: they won a gold medal, as did their colleagues from the Universitat Politècnica de València (UPV). The team from Barcelona has been helped and supported by the Universitat Pompeu Fabra and the Centre for Genomic Regulation (CRG). Researchers Marc Güell and Avencia Sanchez-Mejías travelled with them to Boston. When we asked them what was the main challenge they had to face, all of them agreed: the funding and the development of the project. “A project like this one implies a lot of challenges. Firstly, raising all the money needed to carry it out. Secondly, during the process, we had to face many different problems related to the search of material, the execution of some techniques, the communication of the project… Despite all of that, we got over the challenges and achieved every single goal. 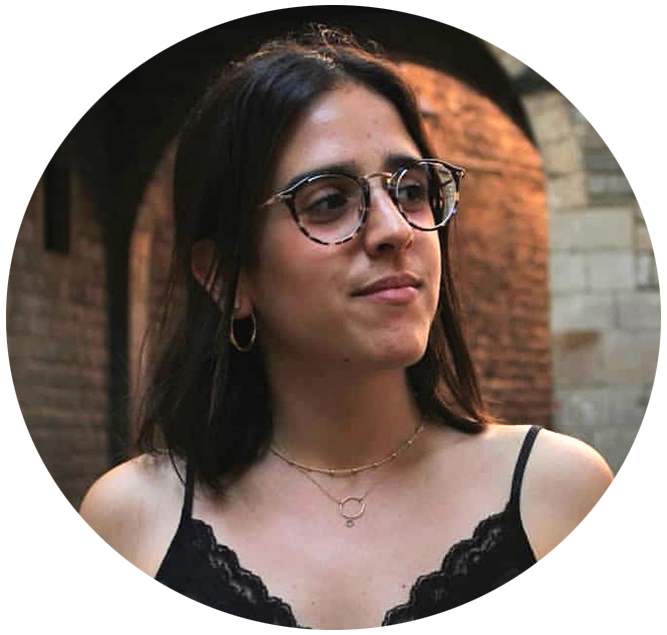 That’s why we are here”, explains Marta Vilademunt, a Human Biology student at the UPF and a component of the iGEM team. Actually, the team started a crowdfunding campaign to cover the cost of the technology and materials they had to use in their research, as well as the cost of the inscription to the iGEM competition. Another of the components of the team, Óscar Rodríguez, confirms that it was a “beautiful initiative, in which you can get experience in the field of synthetic biology”. He also explains that “the project is very interesting for its possible implementation”. For that reason, he decided to join the project. 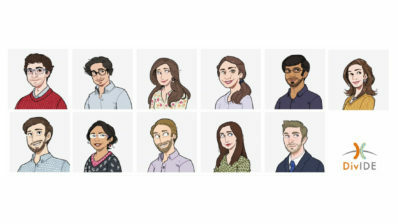 Finally, the team wants to give a piece of advice to the future iGEM participants: “A good organization from the beginning is what matters most; coordination and team-building are also essential. Moreover, they will need institutional and economic support. Finding a place for them to work on their own would be great, too […]. And of course, having good instructors and periodical follow up meetings will lead them to great results”. 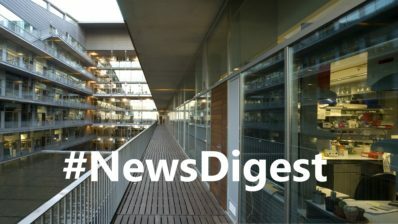 You can read an interview with the team members in the DCEXS-UPF website.